Want to use those great hard cooked eggs? 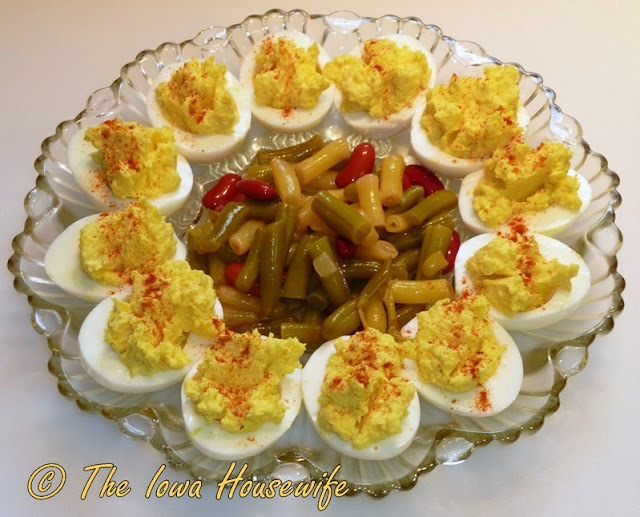 Here is our favorite recipe... classic, ever-popular Deviled Eggs. Myrna and I agree, this is the recipe for deviled eggs – from our mother’s Better Homes and Gardens 1946 cook book. They disappear quickly at any meal, potluck or picnic. To prepare them ahead, store the filling separately and fill them just before serving. We like the center of the plate filled with Home Canned Three Bean Salad. This is the recipe my mom used and the one I always use too. I find that most people love deviled eggs, but few take the time to make them any more. It amazes me to see them pre-made in the grocery store. I have seen plain hard boiled eggs for sale in the grocery store also. Strange and sad that people don't seem to know how to do this anymore.